Some time ago, I was in Germany for some Bremen banana business (BBB). 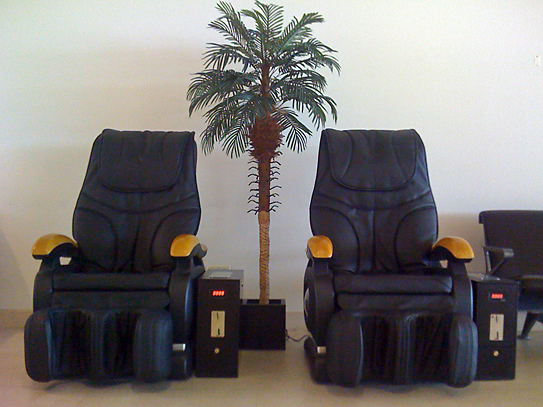 Upon returning home we had to wait quite a long time in the departure hall before finally taking off and while having more than enough time to kill in the meantime, I stumbled upon these two black massage seats, which to me looked quite dangerous. Right in the middle between the two love seats, a plastic palm tree … grew. Now I wonder whether waiting or stranded passengers are more likely to be massaged with or without the tree?